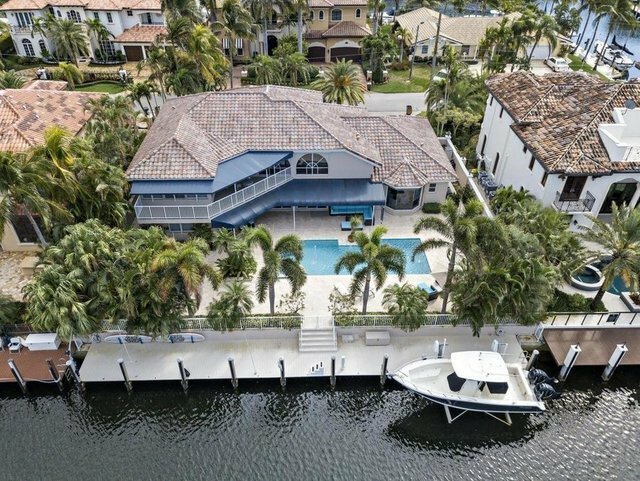 Elegant 5/3.5 totally updated waterfront home in prestigious Lighthouse Point. 100ft on deepwater close to inlet. Huge master suite w/ balcony overlooking captivating water views. Grand foyer, high ceilings. Gourmet kitchen, walk in pantry plus breakfast area w/Bay windows overlooking pool and canal. 5th bedroom set up as an office with built-ins. Second master bedroom en suite on first floor. 2 car garage, separate laundry room with extra storage space. Unique media room. Private lushly landscaped front entrance w/waterfall. Oversized heated pool, great space for entertaining. Brock dock, 14,000 lb remote control boat lift. Whole house generator hook up. Bring your yacht!